I became fascinated with amber for a variety of reasons--the warm glow in sunlight, the light weight, UV flourescence, and warm to touch. 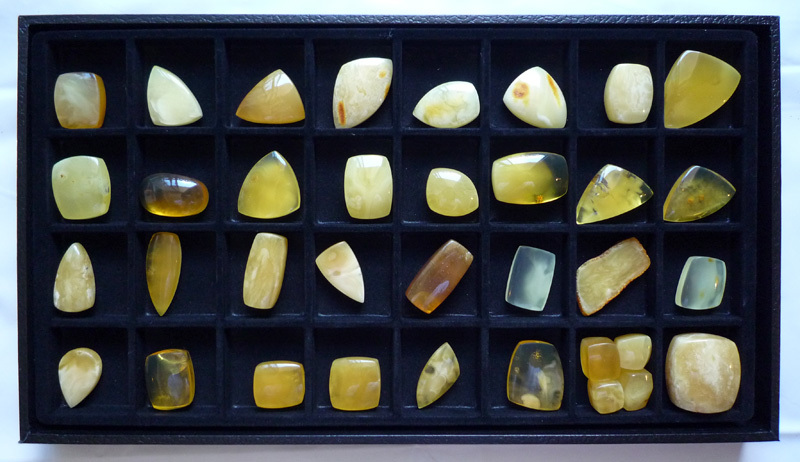 The problem is that finished amber on the market is always set in jewelery, but what I wanted was free-form polished cabochons. Over a period of several months, it gradually dawned on me that I could polish amber from rough on my own, so I set out to figure out how to do that. Initially, I just used sandpaper with increasing grit and did a final polish with cloth and jeweler's rouge. Then I found a lapidary store nearby where the owner was willing to give me lessons on using a lapidary machine to polish amber. These machines essentially have 6 resin-bonded diamond wheels of increasing grit, but they retail for around $2000. After some online searching, I found someone who had figured out how to create similar a similar setup much cheaper by putting the parts together himself. So I got a setup of my own for about $600. 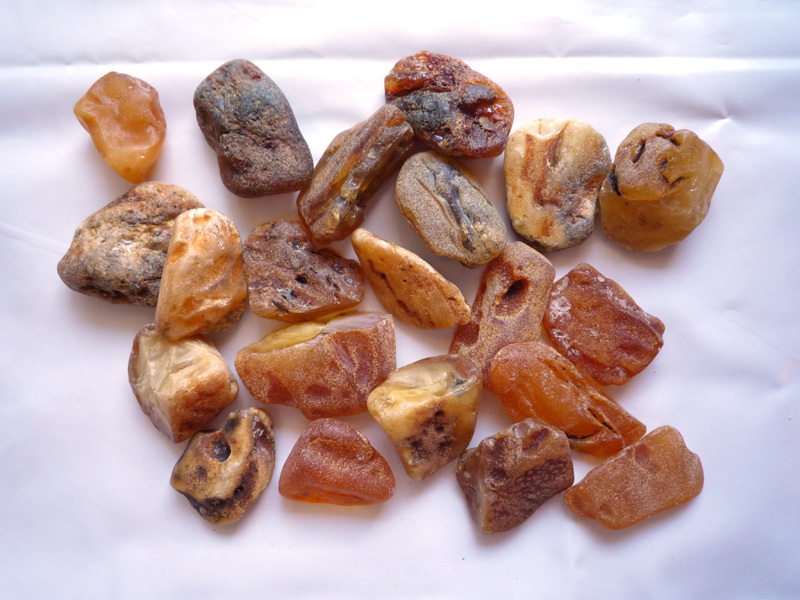 I mail order amber rough from the Baltic region and the Dominican Republic. 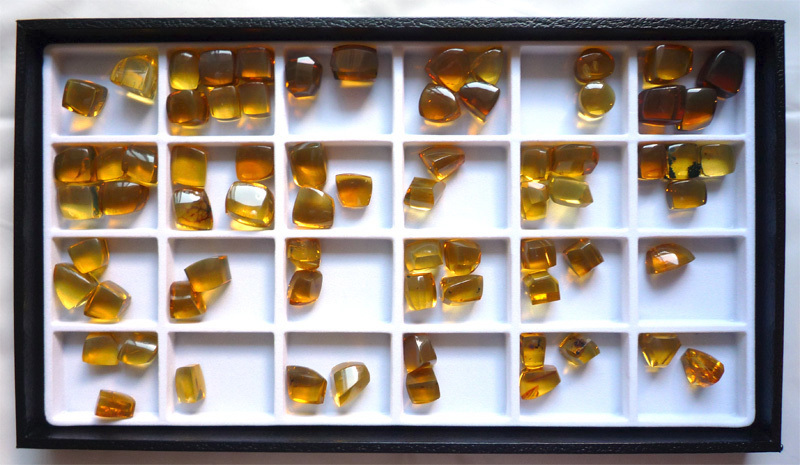 Here's what the amber looks like at different steps of the process. About 95% of the amber on the market comes from the Baltic region. 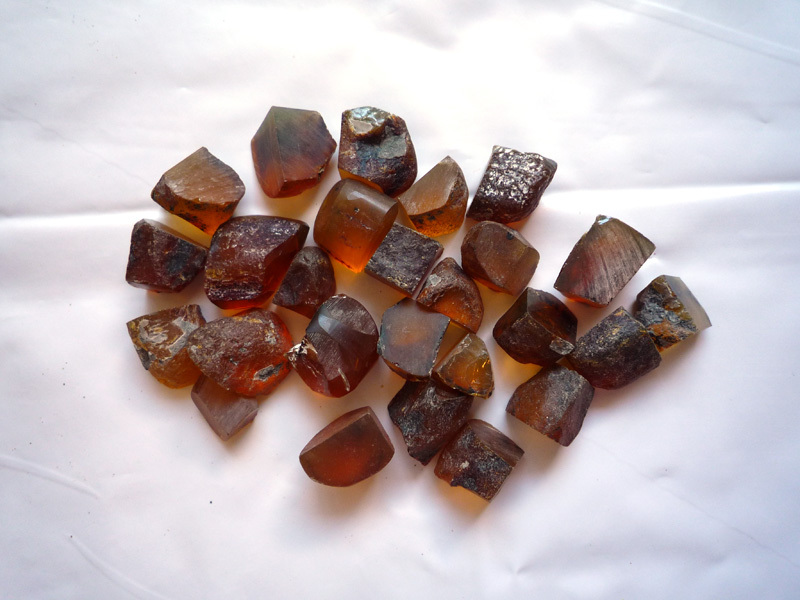 This amber tends to be semi-translucent and is actually seldom clear naturally (caused by microscopic air bubbles), but this creates a wide array of possible amber colors and shades with fascinating patterns where colors mix. Depending on the size and shape of the rough, I might use a trim saw to break it down into smaller pieces or to get particular shapes. And here's what the polished amber looks like. There is also amber from the Dominican Republic and the Mexico Chiapas region. This amber tends to be very clear, ranging from lemon, honey, to cognac tones. Compared with typical Baltic amber, the Dominican/Chiapas amber is remarkably clear. 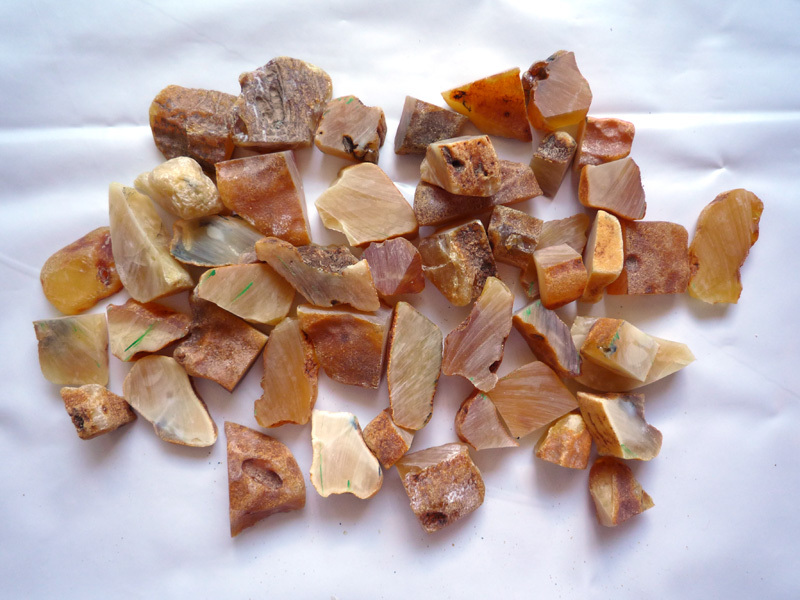 But the coolest aspect of Dominican/Chiapas amber is that it has relatively strong flourescence under normal UV from sunlight, so it typically flouresces a shade of green or bluish-green under normal sunlight. The most striking ones flouresce blue and is known as blue amber. 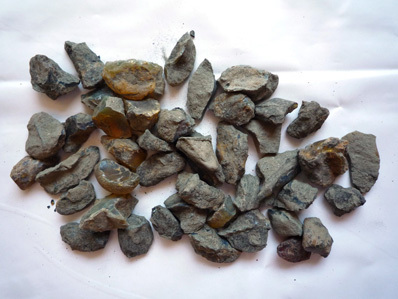 This type of amber has a "contaminant" that is residue from forest fires and it is very difficult to find blue amber that doesn't have a great deal of inclusions. 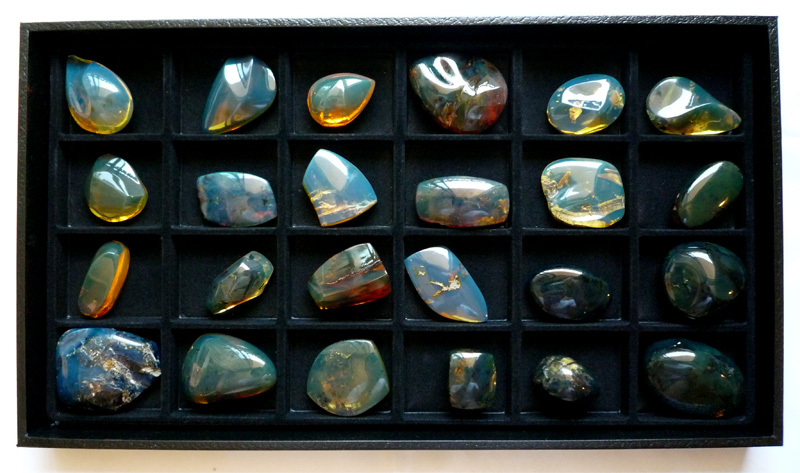 But blue amber when polished is really quite amazing. 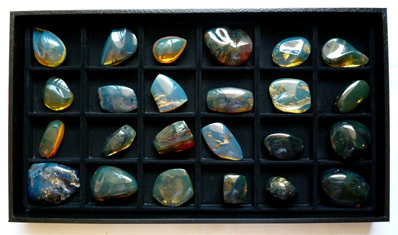 Here are some cabochons I have that range from green to blue flourescence.